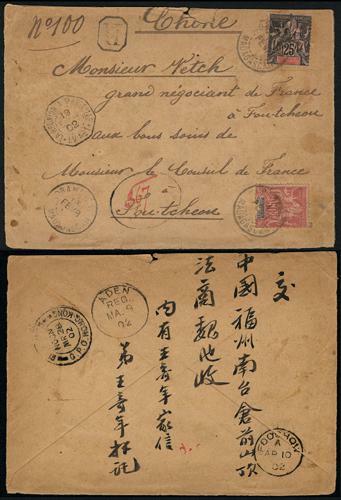 1903 (Jul 28) Shanghai to Shantung Taian postcard, mixed franking with China, USAm Japanm Britian, Russia and France in China PO issues, canceled by corresponding cds., along with Chinan oval transit and a rare small trisected Shantung Taian arrival cds. 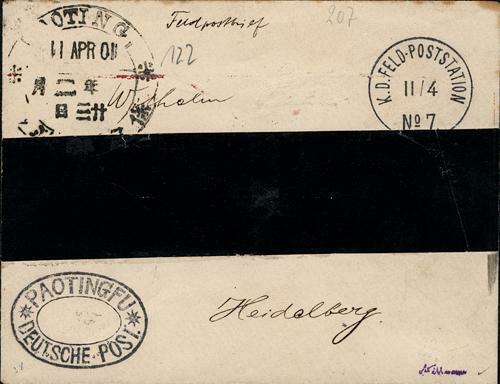 VF-F.
1901 (Apr 11) WWI mourning cover from Paoting to Germany, bearing Paoting Dollar cds., along with scarce Paotingfu German PO and German Military PO transit. On reverse with Germany arrival. 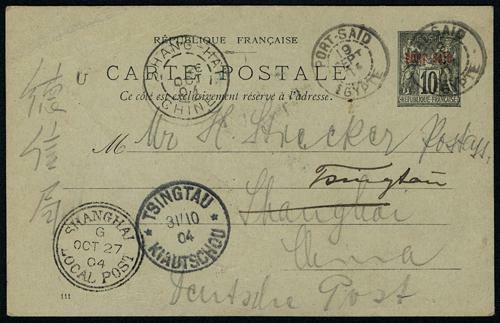 VF-F.
1865 (Mar 21) England to Shanghai incoming Postage Due cover, franked with QV 1 shilling issues, tied by Manchester 498 killer cancel, along with "INSUFF_STAMPED VIA MARSEILLES" instructional cachet. 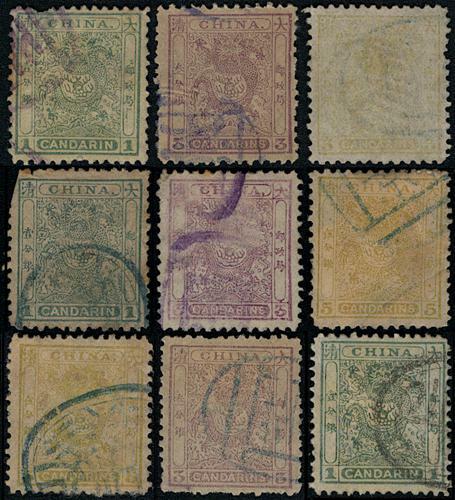 On reverse with London transit and Shanghai Index C arrival. 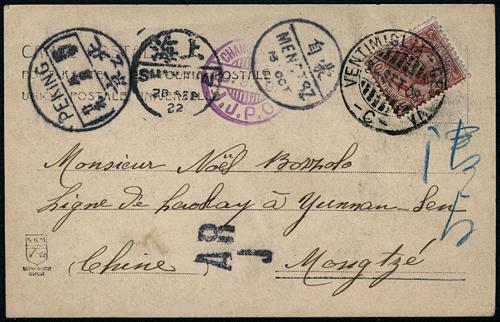 VF-F.
1902 incoming mail from Madagascar to Foochow, China, franked with French 25c and 50c, tied by Madagascar cds., along with R mark. On reverse with Aden, Hong Kong transit and Foochow arrival. Rare incoming mail from Africa. 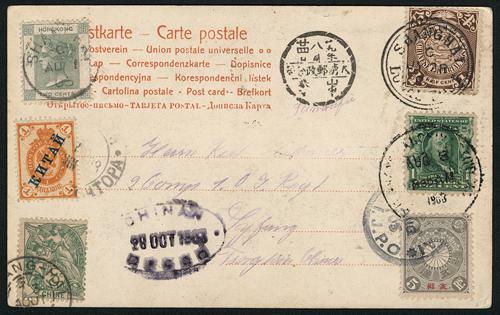 VF-F.
1904 incoming postal card from Egypt to Shanghai, forwarded to Tsingtao, tied by Port Said, Egypt cds., along with Shanghai LPO, French PO transits and Tsingtao German PO arrival. 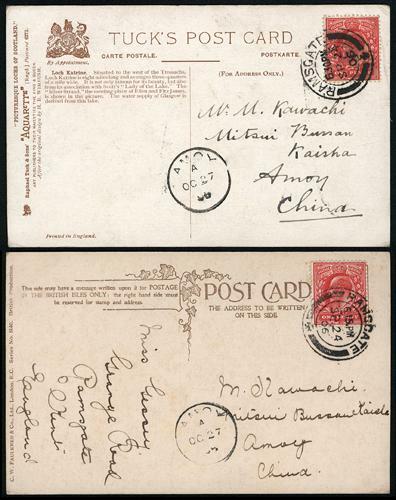 VF-F.
1906 two incoming postcard from England to Amoy, both bearing Amoy british PO cds. 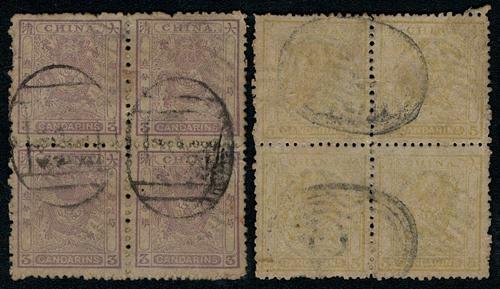 VF-F.
1885 Large Dragon Thick Paper Rough Perforation 1Cd to 5Cd and Small Dragon P12.5 Rough Perforation complete sets (Chan 10-12, 16-18), all used. Large Dragon VF-F. Small Dragon with colour stained on 1Cd & 3Cd. F-VF. 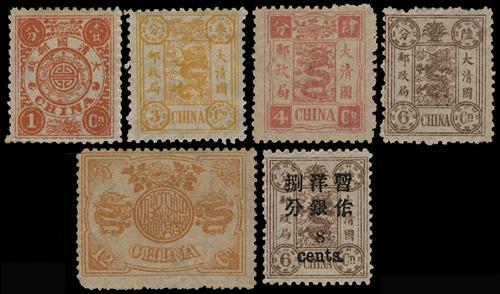 1885-88 Small Dragon Issues mixed perforation sets x 9, all used, some with perfs faults. 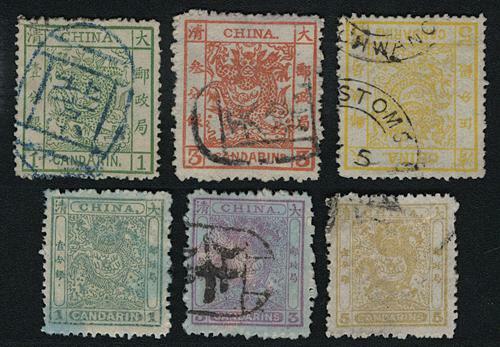 Mostly VF-F.
1885-88 Small Dragon Issues mint and used stamps x 10, comprising 1Cd x 6 mint, 3Cd x 1 mint and 3 used. 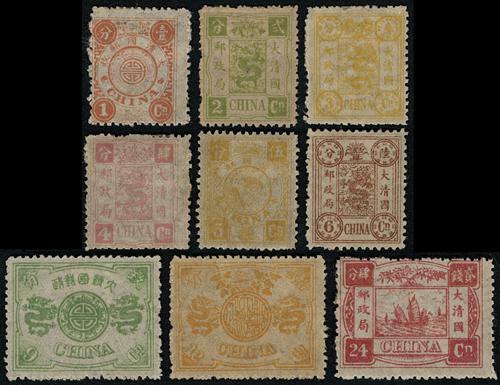 Generally VF-F.
1880s Small Dragon Issue 3Cd & 5Cd, both in used block of 4, both used with Customs seals. 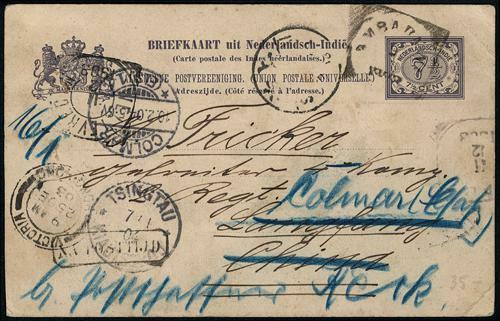 VF-F.
1885 Small Dragon P12.5 Rough Perforation 3Cd, with imperf at left variety, used with Chefoo Customs seal. VF-F.
1894-97 a group of 7 Dowager 1st Print and surch. issues, all fresh MH with lovely original gum. Nice colour. VF. 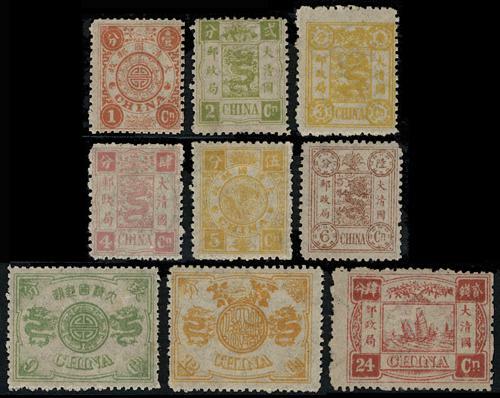 1894 Dowager First Print 1Cd to 24Cd complete set (Chan 22-30), all used with Customs seals. 12Cd with a thin spot on reverse, other VF. 1894 Dowager First Print 1Cd to 24Cd complete set in blcoks of 4 (Chan 22-30), some with margins, 24Cd margin seperated. All canceled by Shanghai Customs seal. 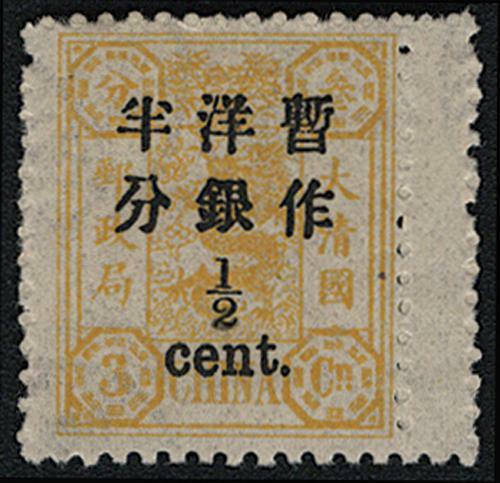 Toned on reverse. VF-F. 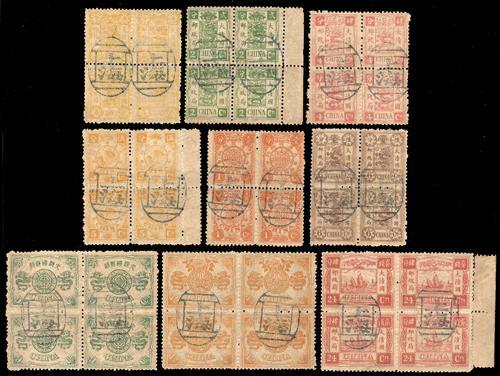 Extremely rare used set in blocks of 4. 1897 Dowager Second Print 1Cd to 24Cd complete set (Chan 22-30), fresh MH with original gum. VF-F. A rare set. 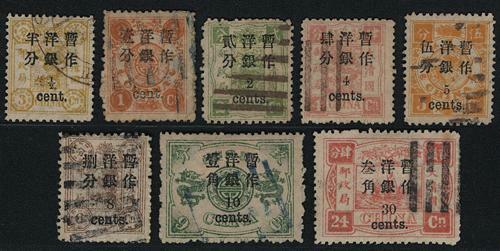 1897 Dowager Issue Second Print complete set (Chan 22S-30S), MH with original gum. 2Cd with a minor thin spot other VF-F. A very rare set of Customs Post issues. 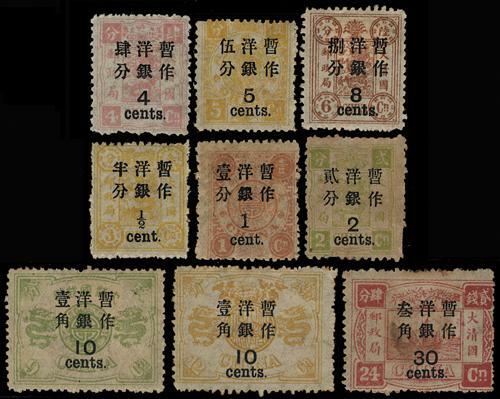 1897 Dowager Small Figure Surcharge set, without 10c on 6Cd and 10c on 12Cd, all postally used. VF-F.
1897 Dowager surch. 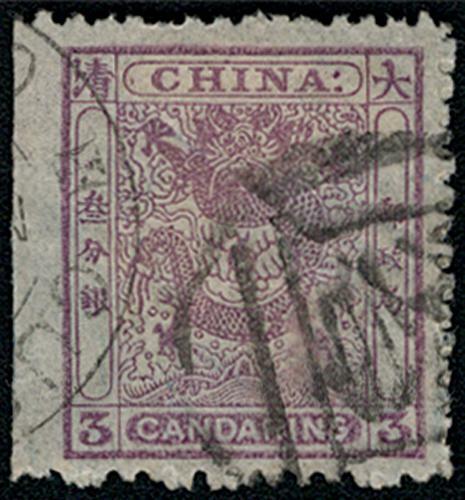 Small Figure used stamps x 6, canceled by nice postmarks. 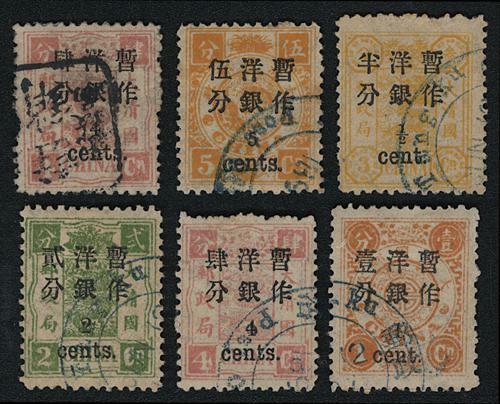 VF-F.
1897 Dowager 2nd Print Large Figure Wide Spaced Surcharges complete set (Chan 56-64), MNH with original gum, some toned. VF-F.
1897 Dowager 1st Print Large Figure Wide Spaced Surcharges 1/2c on 3Cd with right gutter margin (Chan 47), fresh MLH with original gum. Very Fine. 1897 Dowager Large Figure Surch. 2c horizontal strip of 4, used with Chungking Dollar cds. and Pakua cancel. VF-F.